The Bishop of Bristol and his wife have been injured in a serious car accident on the M4 on Sunday afternoon. 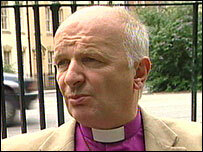 The Right Reverend Michael Hill, 57, broke his shoulder in the accident and has been discharged from hospital. His wife Anthea, 61, was seriously injured and remains at the John Radcliffe hospital in Oxford. Diocese spokesman John Lloyd said: "Mrs Hill came out of surgery on Monday evening and is still very poorly but stable." They were travelling back from St Paul's in Slough after attending the church's centenary celebrations. A spokesman for the diocese said church people throughout the UK will be praying for both of them. The diocese was due to hold services in Bristol cathedral, St Peters in Chippenham and Christ Church, Swindon on Monday at 1715 BST to pray for them. The diocese spokesman John Lloyd said: "We pray and wish them both a speedy recovery." Police shut the stretch of road between junctions 14 at Hungerford and 15 at Swindon east in both directions just after 1500 BST on Sunday. The eastbound carriageway was reopened about an hour-and-a-half later.